Aims To perform a meta-analysis of the association between CYP2C19 loss- and gain-of-function variants and cardiovascular outcomes and bleeding in patients with coronary artery disease treated with clopidogrel, and to explore the causes of heterogeneity between studies. Methods A comprehensive literature search was conducted. A random-effects model was used to summarise the results. In the presence of between-study heterogeneity, a meta-regression analysis was performed to identify study characteristics explaining this heterogeneity. Results Patients who carried a loss-of-function allele, mainly CYP2C19*2, did not present an increased risk of a cardiovascular event, HR =1.23 (95% CI 0.97 to 1.55). Substantial heterogeneity was observed between studies (I2 =35.6), which was partially explained by the study sample size: the pooled HR was higher among studies with a sample size <500 patients (HR =3.55; 95% CI 1.66 to 7.56) and lower among studies with a sample size ≥500 (HR =1.06; 95% CI 0.89 to 1.26). 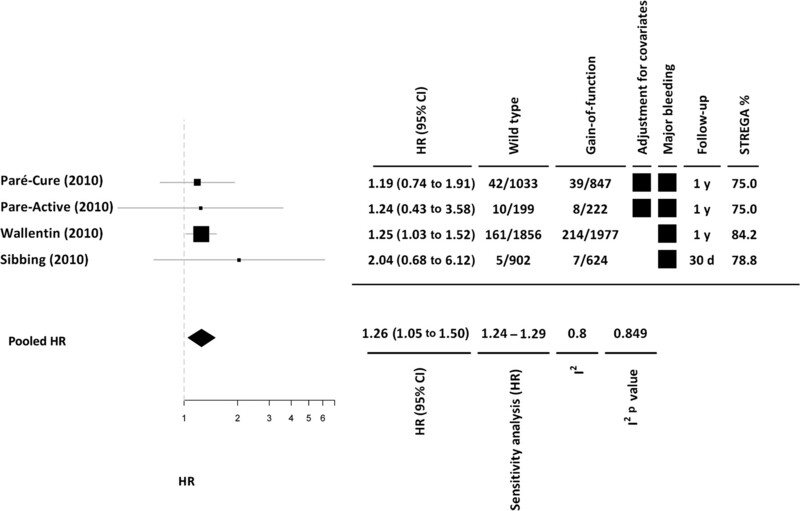 CYP2C19*2 was associated with an increased risk of a stent thrombosis (HR =2.24; 95% CI 1.52 to 3.30). The gain-of-function allele, mainly CYP2C19*17, was associated with a lower risk of cardiovascular events (HR =0.75; 95% CI 0.66 to 0.87) and a higher risk of major bleeding (HR =1.26; 95% CI 1.05 to 1.50). Conclusions Not only CYP2C19 loss-of-function but also gain-of-function alleles should be considered to define the pharmacogenetic response to clopidogrel. The results question the relevance of the CYP2C19 loss-of-function alleles in the prediction of major cardiovascular events beyond stent thrombosis in coronary patients treated with clopidogrel. The gain-of-function variant is associated with a lower risk of cardiovascular events but a higher risk of bleeding. The mechanisms leading to a poor response to clopidogrel are not clearly understood, although it has been suggested that clinical, cellular or genetic factors may be involved.6 The prodrug, clopidogrel, is converted into an active metabolite, which selectively and irreversibly binds to the P2Y12 receptor on the platelet membrane.7–9 Conversion is achieved by the hepatic cytochrome P450 (CYP) system in a two-step oxidative process, and CYP2C19 is involved in both of these steps. In recent years, several studies have reported a series of loss-of-function alleles in CYP2C19, in particular the CYP2C19*2 allele, that result in reduced activation of clopidogrel,10 11 a lower antiplatelet effect,12–14 and increased risk of cardiovascular events in patients receiving clopidogrel. Recently, four meta-analyses15–18 have reported a significant association between the CYP2C19*2 allele and adverse major cardiovascular clinical outcomes and stent thrombosis in patients with coronary artery disease (CAD) treated with clopidogrel. However, most of these meta-analyses report significant heterogeneity between studies, although the causes of this heterogeneity have not yet been established. Moreover, none of these meta-analyses has explored the role of CYP2C19 gain-of-function variants in major cardiovascular clinical outcomes and the risk of bleeding. The aims of this study were to: (i) perform an updated systematic review and a meta-analysis of previous studies that analysed the association between CYP2C19 loss- and gain-of-function variants and cardiovascular outcomes and major bleeding in patients with CAD treated with clopidogrel; (ii) explore the potential causes of heterogeneity between studies. A comprehensive search of the PubMed and ISI Web of Science databases from its inception through October 2010 was conducted to identify studies that evaluated the relationship between genetic variants in CYP2C19 and cardiovascular events and bleeding. For cardiovascular events, we queried MeSH terms and the article text for the following search terms: (‘clopidogrel’) AND (‘angioplasty’, ‘revascularisation’, ‘outcome’, ‘cardiovascular events’, ‘stent thrombosis’, ‘recurrence’, ‘acute coronary syndrome’, ‘percutaneous intervention’) AND (‘genetics’, ‘genotype’, ‘gene’, ‘snp’, ‘polymorphism’). For bleeding events, we substituted the list of clinical events for ‘bleeding’ and we kept the rest of the terms previously mentioned. The articles returned by this search were manually screened, first on the basis of the title, then the abstract and finally the complete manuscript, to assess their appropriateness for inclusion in the meta-analysis. References cited in these articles were also reviewed to identify additional published articles not identified by the database search. Case reports, abstracts, editorials and review articles were excluded. The search strategy was limited to articles published in English. The meta-analysis included genetic association studies that fulfilled the following criteria: (i) the study analysed genotype data for the CYP2C19 loss- or gain-of-function polymorphisms; (ii) study participants were patients with CAD receiving clopidogrel treatment; (iii) the study used a case–control or prospective design; (iv) the study evaluated clinical outcomes; and (v) the study reported data on the size and variance of the risk effect. Two investigators (MZ and RE) independently extracted data. The data extracted included information about the study design characteristics, the outcomes assessed, the cohort characteristics, genotype, allele frequencies and genetic model used in the analysis, and the reported results. The following design and cohort characteristics were collected: number of patients, mean age and mean body mass index of the participants, proportion of women, proportion of patients with diabetes, race, clinical inclusion criteria, clopidogrel dosages, primary outcomes of the study, genotype distribution, time of follow-up, estimates of associations, and adjustment for confounding factors. Disagreements were resolved through consensus. Gain-of-function: rs12248560 (*17), a 4195C→T/A substitution. For the current meta-analysis, we defined three outcomes of interest. (a) Major adverse cardiovascular events. These were defined as any cardiovascular event (fatal and non-fatal myocardial infarction, stroke, unstable angina), recurrent ischaemia (symptoms compatible with ischaemia needing hospital readmission and coronariography), or death from other cardiovascular causes during follow-up. (b) Definite or probable stent thrombosis. Definite stent thrombosis was defined as acute coronary syndrome and either angiographic or pathological confirmation of thrombosis. Probable stent thrombosis was defined as unexplained death or myocardial infarction in the territory supplied by a stented vessel without angiographic confirmation. (c) Major bleeding. Defined in most of the studies according to the TIMI criteria (intracranial haemorrhage or clinically significant overt signs of haemorrhage associated with a fall in haemoglobin of >5 g/dl (or, when haemoglobin is not available, an absolute fall in packed cell volume of >15%)). Owing to the low frequency of the minor alleles analysed in this study at the population level, most of the studies have defined a genetic dominant model. We also defined a genetic dominant model for this meta-analysis, in which the carriers of the rare allele were compared with those homozygous for the wild-type allele. Statistical analysis for the meta-analyses was performed using the meta. DSL function from the R package rmeta. We calculated the overall HR, 95% CI and two-sided p value under a random-effects model (RE; DerSimonian and Laird).21 We tested for heterogeneity of effects between studies by computing the I2 statistic. In the presence of between-study heterogeneity, a meta-regression analysis was performed under a mixed-effects model22 to establish whether any of the following study characteristics could account for this heterogeneity: study design (observational or clinical trial), clinical outcomes included in the study (acute coronary syndrome or PCI), sample size (<500 patients or ≥500 patients), duration of follow-up (<1 year or ≥1 year), type of patients according to risk (low- and high-risk according to the incidence of cardiovascular outcomes <7% or ≥7% per year, respectively), adjustment for clinical covariates, type of patients according to the mean or proportion of classical risk factors also associated with prognosis in each study such as diabetes, hypertension, proportion of female patients, mean age and mean body mass index, and the study's score on a reporting quality scale based on the STREGA statement (compliance with <70% or ≥70% of items). To identify studies that individually had strong effects on the pooled OR, a sensitivity analysis was performed by excluding one study at a time and calculating the OR for the remaining studies. HRs and OR were assumed to represent the same RR. Where more than one result was given in the original report, we used that obtained under the multivariate model with the most complete adjustment for potential confounders. 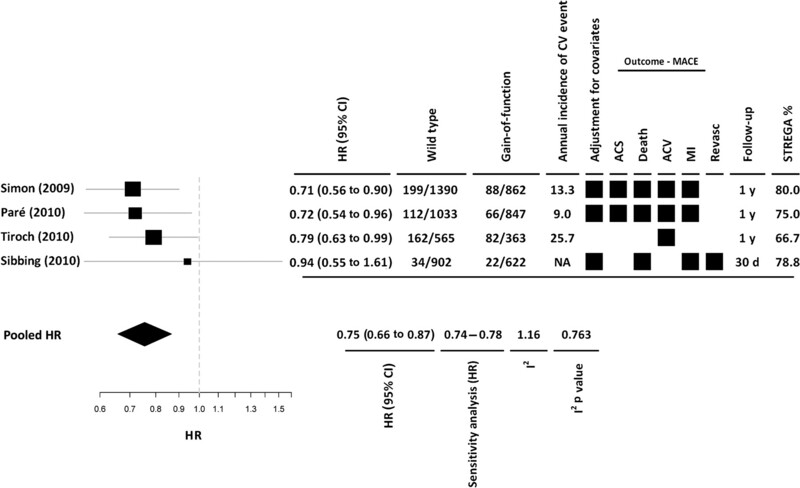 Where ORs or HRs were not reported, effect size estimates were calculated using genotype frequencies stratified according to the presence of the cardiovascular event of interest. Funnel plots of effect size against SE were examined to detect the presence of publication bias. The process of selection of studies for inclusion in the meta-analysis of major adverse cardiovascular events or stent thrombosis is summarised in figure 1. The database search identified 179 unique citations, of which 87 were judged to be of potential interest on the basis of the title. On the basis of the abstract, 13 studies were reviewed in their entirety.11 23–34 One was excluded because it did not meet the eligibility criteria34 and a second one was excluded28 because the data reported were available in a previous study already included in the meta-analysis.11 One additional study35 was identified after review of the references cited, and a second one after review of the manuscripts of the meta-analysis of major bleeding36 (see below). Finally, 13 studies that met the criteria described above were included in the meta-analysis. Flow diagram of the systematic review process. 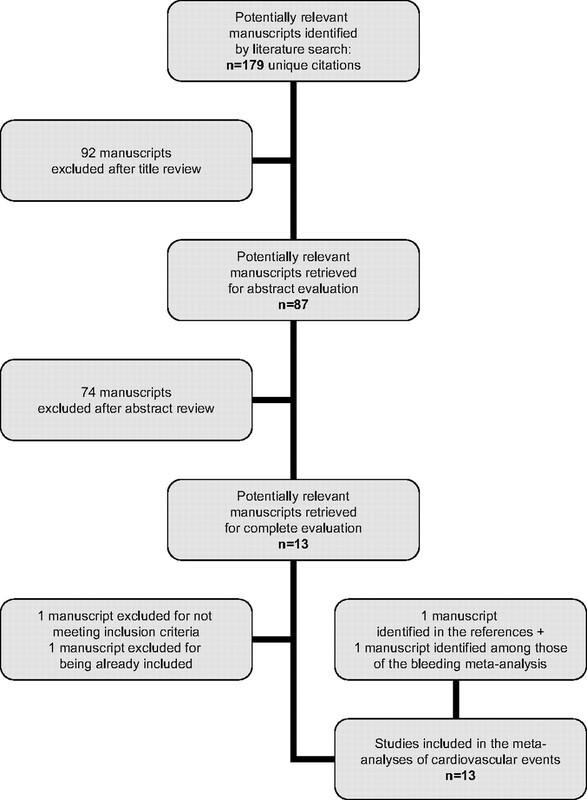 For the meta-analysis of major bleeding, we identified 36 unique citations, of which seven were judged to be of potential interest on the basis of the title. On the basis of the abstract, three articles were reviewed in their entirety,30 31 36 one of them showing results from two different studies: CURE and ACTIVE A.30 We also reviewed the previously identified 12 studies. Finally, four studies were included in this meta-analysis. The main characteristics of these studies are shown in table 1, and the quality of the reported information according to the STREGA criteria is presented in online supplementary table 1. Eleven studies incorporating 16 360 individuals were included in this analysis. Patients that carried a loss-of-function allele, mainly CYP2C19*2, did not have a statistically significant increased risk of a subsequent cardiovascular event (HR =1.23 (95% CI 0.97 to 1.55)) (figure 2). Sensitivity analysis indicated that no one study significantly affected the results of the meta-analysis (pooled HR ranging from 1.11 to 1.31). Risk of major cardiovascular adverse events in coronary patients treated with clopidogrel according to the presence of CYP2C19 loss-of-function alleles and stratified by the sample size of the studies. ACS, acute coronary syndrome; ACV, acute cerebrovascular disease; CV, cardiovascular; MI, myocardial infarction; MACE, major adverse cardiovascular events; PCI, percutaneous coronary intervention; Revasc, revascularisation; ST, stent thrombosis. We observed substantial heterogeneity between the effect sizes observed in each study (I2=35.6; p<0.001). When we analyse the potential causes of this heterogeneity, only study sample size partially explained the observed heterogeneity. Therefore, we stratified the meta-analysis by sample size (N <500 or ≥500), and observed an increase in the pooled HR of a cardiovascular event among studies with a sample size <500 patients (HR =3.55; 95% CI 1.66 to 7.56), and loss of the previously observed association among studies with a sample size ≥500 (HR =1.06; 95% CI 0.89 to 1.26). Significant heterogeneity persisted among the larger studies (I2=15.2; p=0.033) (figure 2), but not among the smaller studies (I2=2.9; p=0.240) (figure 2). The funnel plot of effect size versus SE constructed to investigate possible publication bias was slightly asymmetric, suggesting the presence of some statistical outliers among the studies included (online supplementary figure). Seven studies incorporating 8686 individuals were included in this analysis. Patients who carried a loss-of-function allele, mainly CYP2C19*2, had an increased risk of a stent thrombosis (HR =2.24; 95% CI 1.52 to 3.30; p<0.001) (figure 3). We observed no significant heterogeneity between the reported effect sizes (I2=8.8; p=0.184), and none of the studies had an individually large effect on the result of the meta-analysis (sensitivity analysis pooled HR =1.94–2.49). Risk of stent thrombosis in coronary patients treated with clopidogrel according to the presence of CYP2C19 loss-of-function alleles. ACS, acute coronary syndrome; CV, cardiovascular; PCI, percutaneous coronary intervention. Four studies incorporating 6584 individuals were included in this analysis. Patients who carried a gain-of-function allele, mainly CYP2C19*17, had a lower risk of clinical cardiovascular outcomes (HR =0.75; 95% CI 0.66 to 0.87; p<0.001) (figure 4). We observed no significant heterogeneity between the reported effect sizes (I2=1.16; p=0.763), and none of the studies had an individually large effect on the result of the meta-analysis (sensitivity analysis pooled HR =0.74–0.78). Risk of major cardiovascular adverse events in coronary patients treated with clopidogrel according to the presence of a CYP2C19 gain-of-function allele. ACS, acute coronary syndrome; ACV, acute cerebrovascular disease; CV, cardiovascular; MACE, major adverse cardiovascular events; MI, myocardial infarction; Revasc, revascularisation. Four studies incorporating 7660 patients were included in the analysis. Patients who carried a gain-of-function allele had a higher risk of major bleeding (HR =1.26; 95% CI 1.05 to 1.50; p=0.011) (figure 5). No significant heterogeneity between studies was observed (I2=0.8; p=0.849), and none of the studies had an individually large effect on the result of the meta-analysis (sensitivity analysis pooled HR ranged from 1.24 to 1.29). Risk of major bleeding in coronary patients treated with clopidogrel according to the presence of a CYP2C19 gain-of-function allele. In this study, we evaluated previous evidence regarding the association between CYP2C19 gain- and loss-of-function polymorphisms and cardiovascular outcomes and major bleeding in patients with CAD taking clopidogrel. We observed high heterogeneity between studies analysing the relationship between CYP2C19 loss-of-function alleles and major cardiovascular outcomes. This heterogeneity was partially related to study sample size: smaller studies reported a significant association between the loss-of-function alleles and a higher risk of cardiovascular outcomes, whereas no significant effect was observed in the pooled analysis of studies with a sample size >500 patients. However, these loss-of-function alleles were associated with a higher risk of stent thrombosis. Moreover, the presence of a CYP2C19 gain-of-function allele was associated with a lower risk of major cardiovascular recurrences and a higher risk of major bleeding. In March 2010, the US Food and Drug Administration (FDA) added a ‘boxed warning’ to the label of clopidogrel including a reference to patients who do not effectively metabolise the drug and therefore may not receive the full benefits on the basis of their genetic characteristics,37 and more recently the American College of Cardiology Foundation and the American Heart Association have published a consensus document addressing this FDA warning.38 This guideline states that the role of genetic testing and the clinical implications and consequences of this testing remains to be determined. In some studies the association between the loss-of-function allele and cardiovascular events was higher in those patients treated with PCI and stenting,29 although not in others.27 In our meta-analyses, most of the patients with an acute coronary event were also treated with PCI (>70%)27 29 31 and stenting except in the study of Paré et al,30 in which only 19% were treated with PCI. Therefore, we cannot determine whether the risk of the CYP2C19 loss-of-function allele is similar in non-stented patients. To our knowledge, this is the first study that has meta-analysed the effect of a CYP2C19 gain-of-function allele, CYP2C19*17, on cardiovascular recurrence and major bleeding. Although we only included four studies,29 30 32 36 we observed a clear protective association between this variant and major cardiovascular outcomes. This variant has also been associated with a lower risk of stent thrombosis in one study.31 However, the results of our meta-analysis indicate that this variant is also associated with a higher risk of major bleeding. Therefore the balance between potential benefits and harms should be considered. Our study has several limitations, which are also inherent to many meta-analyses. The retrospective nature of our meta-analysis, incorporating data from published studies and not on individual patients, limits the availability of information on some issues, such as different clinical end points, comorbidities or concomitant therapies. We observed substantial heterogeneity between the results reported by different studies, which was partly accounted for by sample size. We attempted to determine if this heterogeneity might also be explained by other variables such as the type of patient (with or without acute coronary syndrome, with or without PCI, etc) included in the different studies, but are unable to provide a reliable answer to this question because we did not have access to individual level data for these variables. Studies including a more homogeneous type of patients are warranted. Finally, in this analysis we were able to consider a dominant genetic model, but could not explore an additive model. 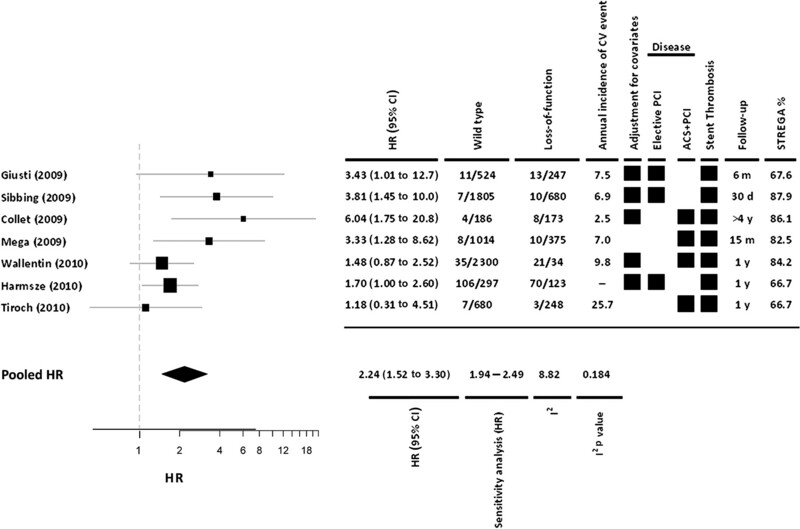 However, in the meta-analyses described by Mega et al,18 it was reported that the effect size for major cardiovascular events of the presence of one loss-of-function allele (HR =1.55; 95% CI 1.11 to 1.27) was similar to that observed when two alleles were present (HR =1.76; 95% CI 1.25 to 2.50). 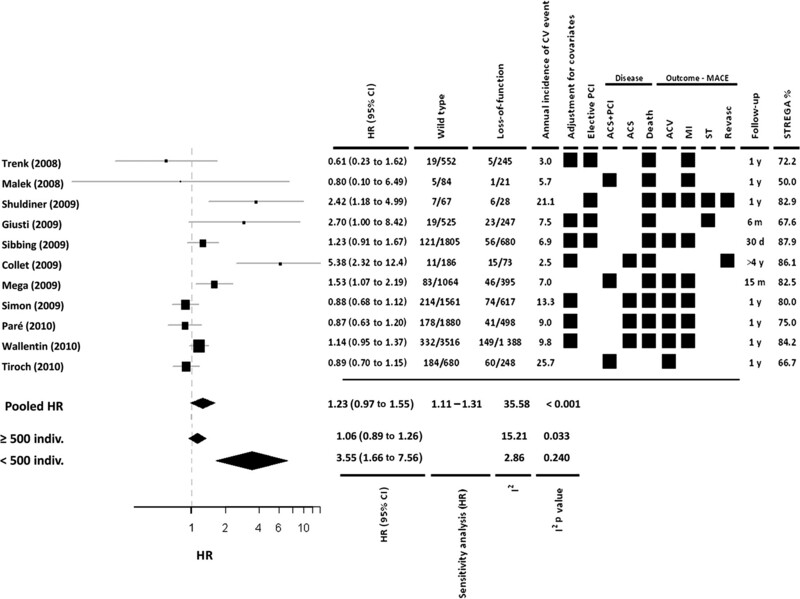 The results of this meta-analysis indicate that not only CYP2C19 loss-of-function but also gain-of-function alleles should be considered to define the pharmacogenetic response to clopidogrel. The main clinical outcome related to these genetic variants is stent thrombosis. Our results question the relevance of the CYP2C19 loss-of-function alleles on the prediction of major cardiovascular events and bleeding in coronary patients treated with clopidogrel.
. Effects of clopidogrel in addition to aspirin in patients with acute coronary syndromes without ST-segment elevation. N Engl J Med 2001;345:494–502. [Erratum published in N Engl J Med 2001;345:1506].
. 2007 Focused Update of the ACC/AHA/SCAI 2005 Guideline Update for Percutaneous Coronary Intervention: a report of the American College of Cardiology/American Heart Association Task Force on Practice Guidelines. Circulation 2008;117:261–95. [Erratum, Circulation 2008;117(6):e161].
. Aspirin and clopidogrel resistance: an emerging clinical entity. Eur Heart J 2006;27:647–54.
. Increased risk in patients with high platelet aggregation receiving chronic clopidogrel therapy undergoing percutaneous coronary intervention: is the current antiplatelet therapy adequate? J Am Coll Cardiol 2007;49:657–66.
. Variability in individual responsiveness to clopidogrel: clinical implications, management, and future perspectives. J Am Coll Cardiol 2007;49:1505–16.
. The antiaggregating activity of clopidogrel is due to a metabolic activation by the hepatic cytochrome P450-1A. Thromb Haemost 1994;72:313–17.
. Identification and biological activity of the active metabolite of clopidogrel. Thromb Haemost 2000;84:891–6.
. Identification of the platelet ADP receptor targeted by antithrombotic drugs. Nature 2001;409:202–7.
. The effect of CYP2C19 polymorphism on the pharmacokinetics and pharmacodynamics of clopidogrel: a possible mechanism for clopidogrel resistance. Clin Pharmacol Ther 2008;84:236–42.
. Cytochrome P-450 polymorphisms and response to clopidogrel. N Engl J Med 2009;360:354–62.
. Cytochrome P450 2C19 loss-of-function polymorphism is a major determinant of clopidogrel responsiveness in healthy subjects. Blood 2006;108:2244–7.
. Common polymorphisms of CYP2C19 and CYP2C9 affect the pharmacokinetic and pharmacodynamic response to clopidogrel but not prasugrel. J Thromb Haemost 2007;5:2429–36.
. Effect of cytochrome p450 polymorphisms on platelet reactivity after treatment with clopidogrel in acute coronary syndrome. Am J Cardiol 2008;101:1088–93.
. Cytochrome P450 2C19(*)2 polymorphism and cardiovascular recurrences in patients taking clopidogrel: a meta-analysis. Pharmacogenomics J 2011;11:199–206.
. Cytochorme P450 2C19 polymorphism is associated with poor clinical outcomes in coronary artery disease patients treated with clopidogrel. Mol Biol Rep 2011;38:1697–702.
. Cardiovascular risk in clopidogrel-treated patients according to cytochrome P450 2C19*2 loss-of-function allele or proton pump inhibitor coadministration: a systematic meta-analysis. J Am Coll Cardiol 2010;56:134–43.
. Reduced-function CYP2C19 genotype and risk of adverse clinical outcomes among patients treated with clopidogrel predominantly for PCI. JAMA 2010;304:1821–30.
. Strengthening the reporting of genetic association studies (STREGA): an extension of the STROBE statement. Ann Intern Med 2009;150:206–15.
. Qualitative assessment of previous evidence and an updated meta-analysis confirms lack of association between the ESR1 rs2234693 (PvuII) variant and coronary heart disease in men and women. Atherosclerosis 2009;207:480–6.
. Meta-analysis in clinical trials. Controlled Clinical Trials 1986;7:177–88.
. A random-effects regression model for meta-analysis. Statistics in Medicine 1995;14:395–411.
. Cytochrome P450 2C19 681G_A polymorphism and high on-clopidogrel platelet reactivity associated with adverse 1-year clinical outcome of elective percutaneous coronary intervention with drug-eluting or baremetal stents. J Am Coll Cardiol 2008;51:1925–34.
. Association of cytochrome P450 2C19 genotype with the antiplatelet effect and clinical efficacy of clopidogrel therapy. JAMA 2009;302:849–57.
. Cytochrome P450 2C19 loss-of-function polymorphism, but not CYP3A4 IVS10 + 12G/A and P2Y12 T744C polymorphisms, is associated with response variability to dual antiplatelet treatment in high-risk vascular patients. Pharmacogenet Genomics 2007;17:1057–64.
. Cytochrome P450 2C19 loss-of-function polymorphism and stent thrombosis following percutaneous coronary intervention. Eur Heart J 2009;30:916–22.
. Cytochrome P450 2C19 polymorphism in young patients treated with clopidogrel after myocardial infarction: a cohort study. Lancet 2009;373:309–17.
. Genetic variants in ABCB1 and CYP2C19 and cardiovascular outcomes after treatment with clopidogrel and prasugrel in the TRITON-TIMI 38 trial: a pharmacogenetic analysis. Lancet 2010;376:1312–19.
. Genetic determinants of response to clopidogrel and cardiovascular events. N Engl J Med 2009;360:363–75.
. Effects of CYP2C19 genotype on outcomes of clopidogrel treatment. N Engl J Med 2010;363:1704–14.
. Effect of CYP2C19 and ABCB1 single nucleotide polymorphisms on outcomes of treatment with ticagrelor versus clopidogrel for acute coronary syndromes: a genetic substudy of the PLATO trial. Lancet 2010;376:1320–8.
. Protective effect of the CYPC19 *17 polymorphism with increased activation of clopidogrel on cardiovascular events. Am Heart J 2010;160:506–12.
. CYP2C19*2 and CYP2C19*3 alleles are associated with stent trombosis: a case-control study. Eur Heart J 2010;31:3046–53.
. Frequency of CYP3A4, CYP3A5, CYP2C9, and CYP2C19 variant alleles in patients receiving clopidogrel that experience repeat acute coronary syndrome. Heart Vessels 2009;24:73–8.
. Coexisting polymorphisms of P2Y12 and CYP2C19 genes as a risk factor for persistent platelet activation with clopidogrel. Circ J 2008;72:1165–9.
. Cytochrome 2C19*17 allelic variant, platelet aggregation, bleeding events, and stent thrombosis in clopidogrel-treated patients with coronary stent placement. Circulation 2010;121:512–18. FDA Drug Safety Communication: reduced effectiveness of Plavix (clopidogrel) in patients who are poor metabolizers of the drug. http://www.fda.gov/Drugs/DrugSafety/PostmarketDrugSafetyInformationforPatientsandProviders/ucm190836.htm (accessed 3 Aug 2010).
. ACCF/AHA Clopidogrel Clinical Alert: Approaches to the FDA “Boxed Warning”. Circulation 2010;122:537–57. ; NCI-NHGRI Working Group on Replication in Association Studies. Replicating genotype-phenotype associations. Nature 2007;447:655–60.
. Identification of the human cytochorme P450 enzymes envolved in the two oxidative stops in the bioactivation of clopidogrel to its pharmacologically active metabolite. Drug Metab Dispos 2010;38:92–9.
. Late-breaking clinical trials presented at the American Heart Association Congress in Chicago 2010. Clin Res Cardiol 2011;100:1–9.
. Emergence of the concept of platelet reactivity monitoring of response to thienopyridines. Heart 2009;95:1214–19. Funding This work was supported by Spain's Ministry of Science and Innovation through the Carlos III Health Institute - European Regional Development Fund (ERDF) (FIS PI09/90506, CIBER Epidemiologia y Salud Pública, Red HERACLES RD06/0009) and by the Government of Catalonia through the Catalan Research and Technology Innovation Interdepartmental Commission (SGR 1195). GL was funded by the Juan de la Cierva Program, Ministerio de Educación. MT was funded by the Beatriu de Pinos Grant.